Father’s Day has a different meaning when you have kids – obviously. For one thing, now I call my Dad and I have to be nice to the G-man all day. But really, for the past four years, Father’s Day has been about a connection between my past and my present, my experience as a daughter and my experience as a parenting partner, a connection of appreciation and love. I grew up with a stay-at-home mom. 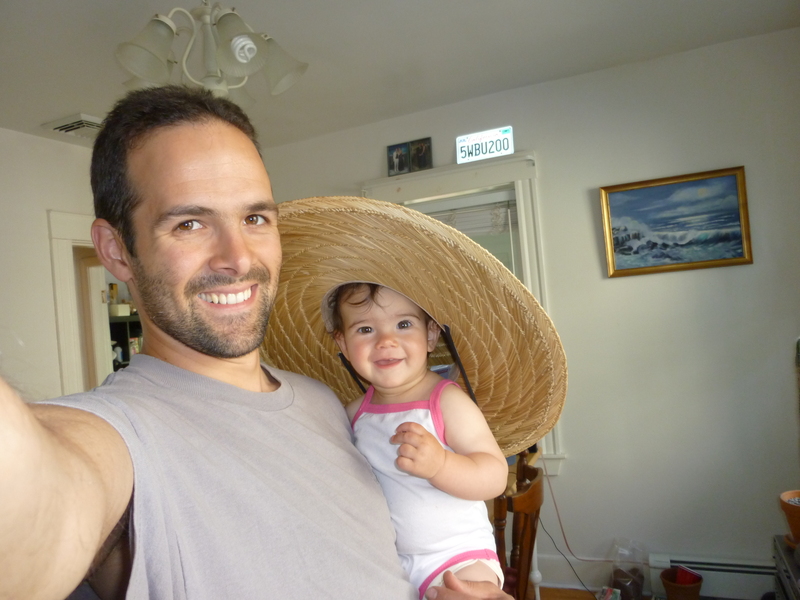 My dad worked hard at his job as a software engineer, but he worked even harder at being a dad. He was there for softball and basketball games. He was there for family dinners, even when he had to go back to working afterwards. He really, truly, would do anything to support me and my sister. As the official “breadwinner” of my family I have a new appreciation for what he did, as I struggle to balance career needs and aspirations with my kids needs and aspirations. I am slowly beginning to understand what it meant when he had to stop in the middle of a project to drive me to camp or make it home for dinner. My dad put family first every day. While that seemed simply like “the way things are” when I was a kid, as a parent, it means so much more. The G-man and I both wanted a stay-at-home-parent for our children. It was what we both grew up with. It was something we valued. We had the economic ability to do it. But I made it abundantly clear, when we first talked about having kids, that I had zero desire to stay home. I still don’t know if the G-man ever really thought about staying home before I acutally got pregnant, but once we knew we were really having a kid, he made his plans to exit the working world. He is quick to point out that I liked my job more than him, I made more money, I had summers off that we could spend as a family, etc. All very logical. But what he doesn’t point out is that he exited a field that it is hard to return to. He took on a role that most men don’t. He took a huge leap into a world that was new to him, that he didn’t have a lot of time to prepare for. And he is simply the best dad I could ever wish for my children to have. He is patient about things that drive me crazy. He can play with legos and mike trucks for hours on end. He cooks with a child underfoot. He fixes everything. He has become a playground favorite with other moms and kids alike. He sometimes seems super human to me. Mostly importantly, he loves his children with everything he has. He would do anything for them, and in some ways he does by being their primary caregiver every day. The G-man and his baby bug (IP). She is wearing his gardening/beach/sun hat. Sometimes I feel a divide between me and the G-man when we are in our different parenting roles (me working outside the home, him at home with kids). 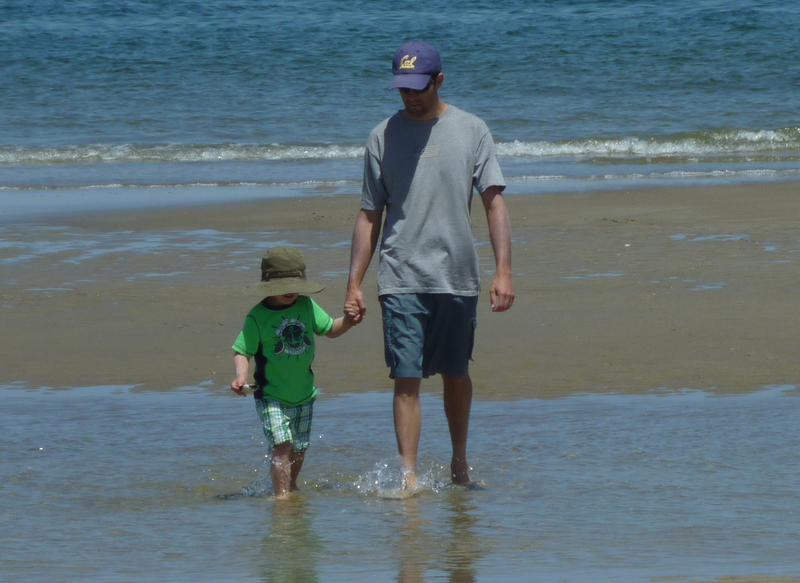 But when I think about the connections between my dad and me, then me and the G-man, I realized that the tie that binds it all together is this: we love our kids. We love them with every fiber of our being. Sure, there is some balancing between taking care of ourselves and taking care of them. Sure, we lose patience sometimes. But when push comes to shove, we gladly do what needs doing to help them grow and thrive. That is what I appreciated when I called my dad; that I am doing the things I love, having the life I do, because he and my mom did what needed to be done for me to grow and thrive. Here in Medford, that is what we celebrated today with our Father’s Day (vegan) ice cream trip. We celebrated the G-man’s love for his family that he lives out in his actions every day. We celebrated our love for him and an appreciation for all the chain of dads (his, mine, and the ones before that) that led us to this wonderful family and this wonderful life we lead. In short, we celebrated fatherhood, and all the gifts the dads in our lives bring us every day. What a beautiful post and exquisite piece of writing! I am actually speechless, filled with an abundance of appreciation, love, and pride for you, G-man (the best son-in-law EVER), my adorable grandchildren, your sister, and, of course, your wonderful dad.